Attention:For these shoes,US 7=40 EU,US 8=41 EU,US 8.5=42 EU,US 9.5=43 EU,US 10=44 EU,US 10.5=44 EU,US 11=45 EU,US 12=46 EU,US 13=47 EU,US 14=48 EU ZhuangLin Water Shoe is made with lightweight mesh and a midfoot webbing system that integrates with slip on for lightweight breathability and an adaptive, supportive fit. 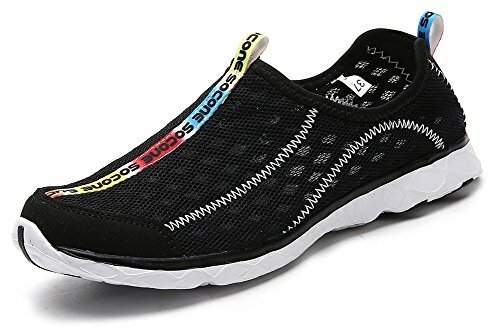 Soft cushioning and breathable RB/Eva outsole,articulated flex grooves offer plush comfort and natural range of motion.Offer you best performance for your water aerobics or river walking. 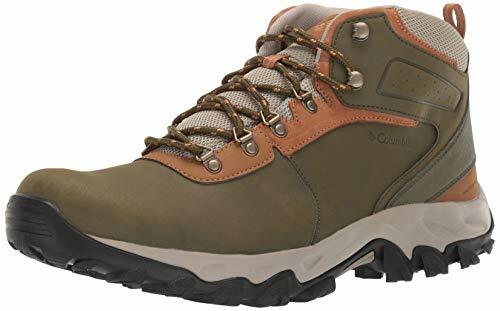 You're sure to have an outdoor positive experience when you have these waterproof boots on your feet. They're comfortable, durable and great looking. The shoes are a must have for your next sport. 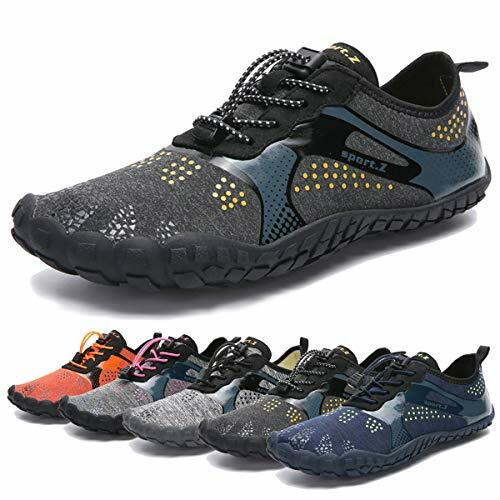 Whether you are doing water aerobics, kayaking, paddle boarding, canoeing, floating down rocky riverbeds, or walking shell-lined beaches, you'll want a pair of water shoes to protect your feet. 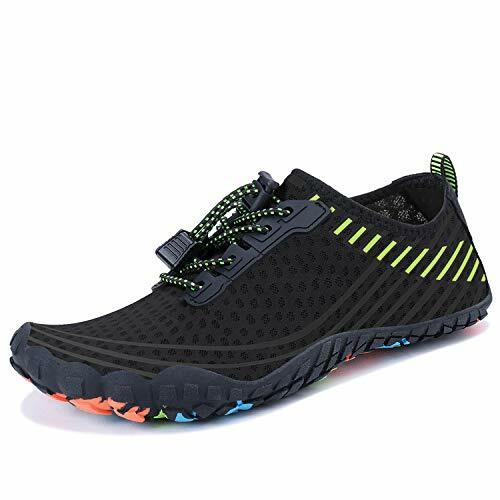 Multifunction: A multi purpose shoe.you can use the shoes as a water & athletic shoe when you go out.Doing some exercises or traveling other country.Packing easily and portable easily because the walking shoes lightweight and Flexing.light weight aquatic shoe. Instead of having to pack two pairs of shoes one for travel and one for swimming you don't need add two shoes tin your luggage. 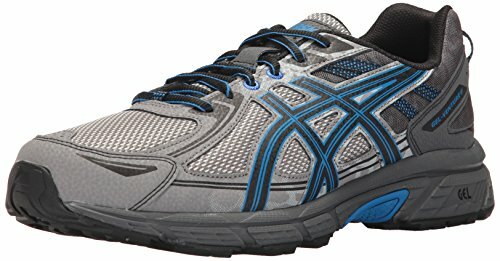 travel light and multi-task with these "two-in-one" water/athletic shoes. 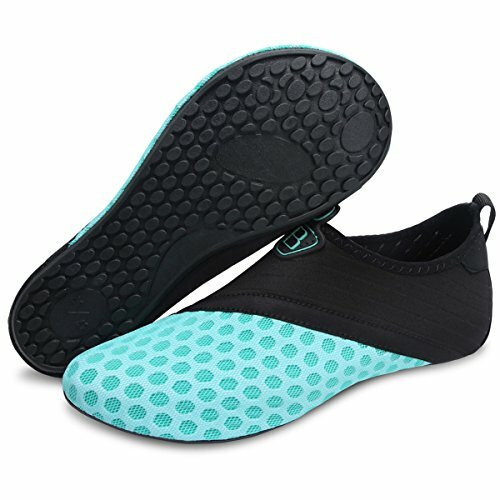 DURABLE AND UNIQUE SOLE: Professional anti slip rubber outsole with a unique pattern, increase the friction and track adhesion to prevent slipping beside the pool and in the wild.unique and durable sole with seven holes on each bottom to ensure proper water flow out of them which creates a cooler and healthier shoe environment, quick-dry, super comfortable during water sports. FOOT SAFETY AND COMFORTABLE: The rubber soles, with a really comfortable and thick foam arch-support insert inside of them, are flexible yet thick enough to protect your feet from stepping on rock and stone. 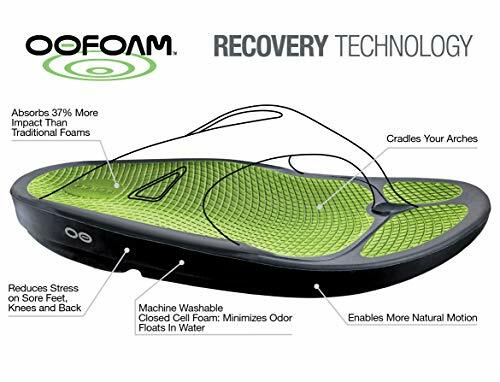 At the same time, the insole perfectly matches the shoes and prevents the insole gets detached when you are hiking or playing water sports. 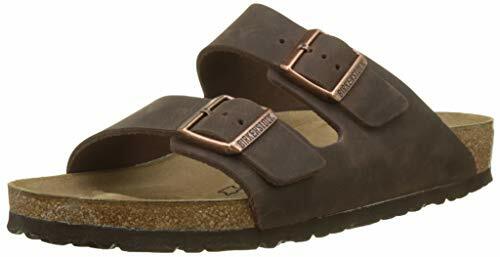 FASHION AND PRACTICAL LOOK OF TOES: Fashion shoes tip, with a toe appearance, give you a more fashion and unique wearing experience. 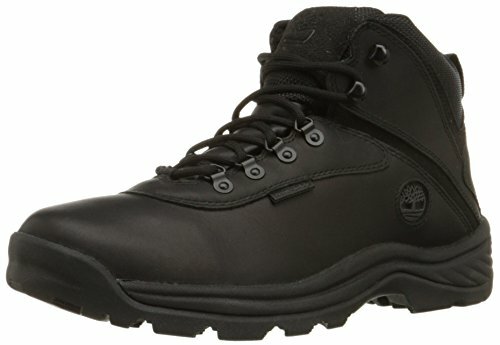 Although there are not separate slots, but thicker toe caps give more cushioning that you needed to provide support when hiking and climbing. Please do not worry they rub your big toe when walking, we provide enough space to ensure comfort. GOOD ELASTICITY AND CONVENIENT: Breathable and smooth fabrics with fine stretch on uppers. Non-mesh, don't let the sand into the shoes. The shoe is ultra-thin, flexible and comfortable. An ideal shoe for rowers, surfers, kayakers and SUP fanatics, the shoe provides grip and comfort out on the water and packs easily into a dry bag at the end of the day. MULTIFUNCTIONAL SHOES IN DIFFERENT CONDITIONS: The shoes are amphibious shoes which can make sure you can enjoy your life in land or in water. 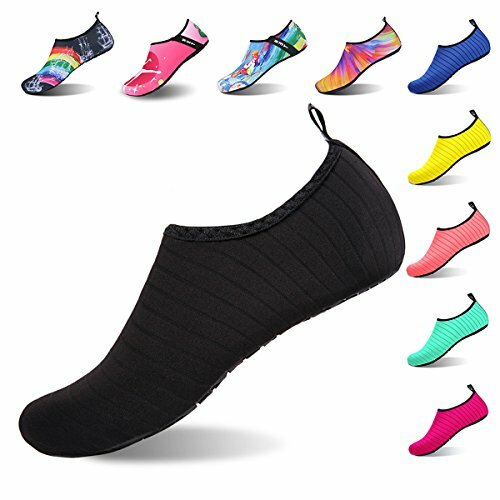 You can use the aqua shoes in surfing, canyoning, kayaking, camping, zip-lining, swimming, jumping, river trekking, paddle rafting, snorkeling, raining, beach visiting, shopping, traveling, water aerobics, jogging, walking,any water playing or land playing. 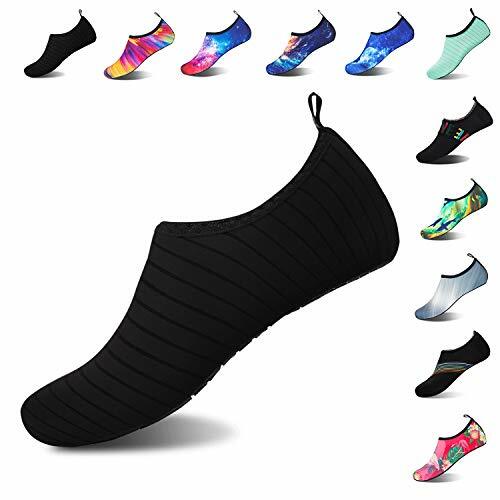 BREATHABLE UPPER - Breathable quick dry upper with fine stretch.